It is very exciting to be able to announce that David has been signed to Oxford University Press as a House Composer. The press release can be found here and an interview with David can be found here. David's Stabat Mater has been made an Editor's Choice in the 2016 Awards Edition of Gramophone Magazine. The recording on Regent Records features the stunning Jennifer Pike as the Violin Soloist, and Edward Whiting conducts the Chapel Choir of Benenden with the composer at the organ. The CD also includes Marian Suite and Ave Maria and is now available here. David's Stabat Mater will receive its UK Premiere on 17th June 2016 at 7pm in Holy Trinity, Sloane Square, London. Jennifer Pike is the Violin Soloist, and Edward Whiting will conduct the Chapel Choir of Benenden. This will also mark the release of the recording of the work, which includes Marian Suite and Ave Maria (Regent Records). The recording will be available from this site after 24th June 2016. David has recently completed a setting of the Nunc dimittis and a Gloria to accompany Finzi's Magnificat. This work was commissioned by the Finzi Trust for the Three Choirs Festival and more details are available here. The World Premiere is on Sunday 6th March at 3pm in Gloucester Cathedral, with the Three Choirs Festival performance on 29th July. 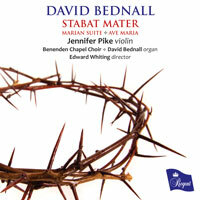 David Bednall's Stabat Mater was recently premiered in Grace Church, Broadway, NYC and had subsequent performances in Christ Church, Greenwich, and St Bart's, NYC. Scored for Upper Voices, Violin, and Organ, it was performed by the Chapel Choir of Benenden School, conducted by Edward Whiting. It will be recorded by them later this year. David Bednall's Three Songs of Remembrance appear on Sospiri's A Multitude of Voices project. This beautiful recording consists of newly commissioned works to mark the Centenary of the start of WWI. It is available from Convivium Records. 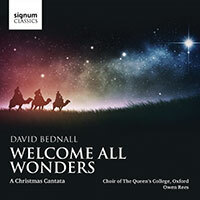 David Bednall's new CD, Welcome All Wonders - A Christmas Cantata, is released on 29th July 2013 on Signum Records. 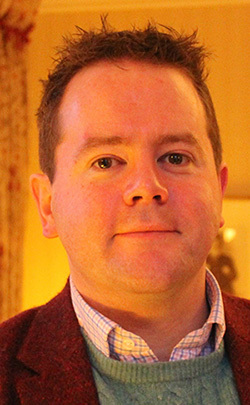 The 78-minute work has been recorded by Owen Rees and The Choir of the Queen's College, Oxford, who commissioned the piece. The 15 movements set beautiful texts in Latin and English, including poetry by Milton, Pope, and Longfellow. Highlights include the thrilling 'Tribus miraculis ornatum', the beautiful 'But peaceful was the night', and the triumphant final movement, setting words from St John's Gospel alongside the joyous 'Hodie'. The work will be published by Faber Music later this year. The CD is now available to purchase here. 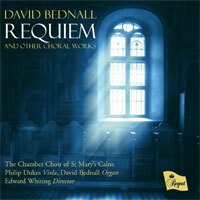 Following the unanimous critical acclaim for Hail, gladdening light, Regent Records has just released a second disc of David Bednall's choral music from Wells Cathedral Choir and Matthew Owens. 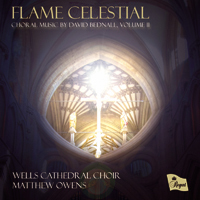 The disc - Flame Celestial - includes the remaining four canticles from The Wells Service, the large-scale Missa Sancti Pauli commissioned by St Paul's Cathedral and a number of other shorter anthems. It is now available to purchase here. 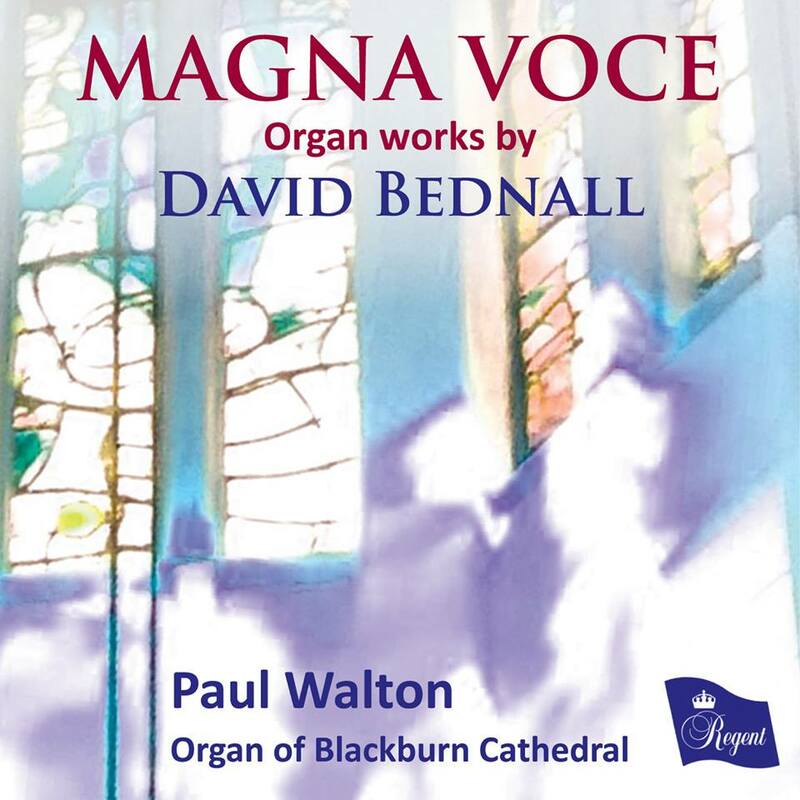 David Bednall's Requiem for Upper Voices, Solo Viola and Organ has recently been released on Regent Records to great critical acclaim and is available for purchase here. The Requiem has been recorded by the Chamber Choir of St Mary's, Calne under their director Edward Whiting. The Viola is played by internationally renowned soloist Philip Dukes and the organ by David Bednall. This has recently been named as a Recording of the Year 2010 by John Quinn on Music Web International. See here for more information. Selected as an Editor’s Choice in the May 2007 edition of Gramophone. For more information on the track-listing click here or to purchase click here. 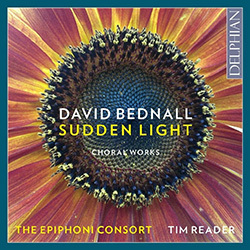 David Bednall is recognized as one of the leading choral composers of his generation and is signed to Oxford University Press. He is also a highly experienced organist, accompanist, conductor, and lecturer. He studied for a PhD in Composition with Professor John Pickard at the University of Bristol and his work has been widely recorded and broadcast to superb international critical acclaim. His work is notable for its vivid and accessible qualities, and acute sensitivity to word-setting. He is University Organist, Director of University Singers, and a Teaching Fellow at The University of Bristol, and Sub Organist at Bristol Cathedral. He has established a reputation as an exciting and virtuosic performer and is noted for his skills as an improviser, particularly in providing the soundtrack to silent films. * You can now securely purchase CDs through this website. Please click here to view the selection on offer. There are also samples from his scores in PDF format, to view them please click here.